Is it safe for your dog to eat Turkey? Read more to find out. Be it a nibble of Thanksgiving dinner or a snack from a package of jerky treats, turkey is a popular snack for canine companions. It added to dog foods, treats and homemade dog food recipes, but is it as safe as it seams? Turkey meat on its own is safe for dogs to eat. It is rich in minerals and, in the case of white meat, lean protein. However, there are a few things to look out for. Raw turkey can contain salmonella, and so only well-cooked meat should be given to dogs. Dark meat and turkey skin are high in fat, a concern for overweight dogs, and too much skin can cause digestive upset. Human turkey jerky contains high levels of salt and should not be fed to dogs. Cooked turkey and chicken bones should never be given to dogs. While there is some <a href=”http://www.aspca.org/blog/raw-food-diets-may-be-dangerous-pets”>controversy</a> about whether or not raw bone is safe, cooked bone is universally recognized as dangerous. Cooking bone changes its structure, making it indigestible to carnivores and likely to splinter. Bone chips and splinters can cause choking, digestive blockages, perforations and the risk of infection. Turkey from Thanksgiving dinner poses a number of unique concerns. Onions, which are highly toxic to dogs, usually permeate Thanksgiving dinner, as do high levels of salt. Turkey stuffing contains bread, which can cause digestive upset in large amounts, and toxic onions. Even plain turkey meat can be dangerous if seasoning was applied to the meat or onion was used as a roasting aromatic. Several <a href=”http://dogaware.com/recall.html#jerky”>recalls</a> have affected turkey-based dog foods and treats that were imported from outside of the USA, leading many pet owners to only purchase products made with American meats. Many dog owners are also concerned about the impact of antibiotics and hormones used in rearing turkey and advise choosing treats, foods and meat for preparation that is antibiotic- and hormone-free. It is possible for dogs to be allergic to turkey. Dogs experiencing an allergy reaction will have gastrointestinal distress and be lethargic. These symptoms will often pass on their own, but it is impossible to watch for difficulty breathing or swelling of the tongue or eyes. Any dog exhibiting those symptoms needs immediate veterinary attention. In brief, plain, cooked turkey may be safe, but it is always a good idea to be wary of what else it might contain. 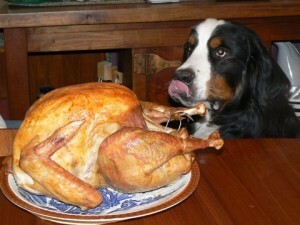 What do other dog owners have to say about whether their dogs can eat Turkey or not? See comments below. Is that true? What about the lunch meat turkey? We feed our dogs lunch meat turkey as a reward and as far as I know they are fine. I am doing research and I am making lists on what dogs can and can’t eat and I don’t want to put things on the wrong list. So to be honest even though I am in 5th grade I think that the info on plain turkey seams true but I believe that lunch meat turkey is fine for them to eat. My dogs have not gotten sick yet and they seam fine. did more research. I think your facts are wrong. I have read on other web sites that turkey meat is good for dogs. Know if dogs can or can't eat Turkey? Help other dog owners by leaving a comment.